The name 'van Eeuwen' is not quite common in the Netherlands. It literally means 'from Ages'. 'Ages" is the multiple form of 100 years. In comparison: the Dutch name 'van Leeuwen' is very common, Leeuwen meaning 'Lions'. A lot of Dutch names start with 'van". As there are not too many van Eeuwen's we feel a bit privileged! In the second half of the 19th century, around 1860, three brothers decided to try there luck in the New World. So there is a American Connection out there, please beware. For further information please consult the relevant links. The family name originates from the island of Goeree-Overflakkee in the south-western part of the country. In the 16- and 17-hundreds the name was written as 'van Eeúwen'. There must have been a reason why the 'ú' was used and why from a certain point in time it changed into a simple 'u'. Less chique I feel.... I have not yet found out the reason behind it. But we will. My mother's family name was 'Pajor' and she was born in Hungary in the small city of Szombathely (literally meaning: Saturday's place) very near the Austrian border. She came to Holland in 1928, when she was 18. I visited the house in which my grandmother once had lived in the very small village of Bozsok. It was interesting that the Austrian - Hungarian border fence was at the back of the garden. An uncle of my mother still l ived in the house when I visited it. He had one arm, the other one was lost in a harvesting machine when he was young. It was said that he never blacked out during and after the incident. I still have an uncle and nephews and nieces over there. We used to travel to Hungary quite a number of times to meet the family out there. In the beginning it was quite an experiences as apart from all the loving kisses from my nieces, I got the same treatment from my nephews. The Dutch are not used to that custom and in the beginning we froze in our tracks when being hugged and kissed by the often unshaven uncles and nephews. However, the many aunts and nieces made up for it. A culture shock but one gets used to it pretty fast I must say. As my wife and I could not speak any Hungarian and the family did not speak any foreign language we decided to learn the lingo. We did that by turn, one of us had to take care of our two children in the evenings. We took Hungarian language courses at the People's University in Rotterdam. In August 1977 I also attended a summer course at the Kossuth Lajos University of Debrecen, a town in the eastern part of Hungary. It was interesting to note that a large group of Finnish students took part in this language course. That is explainable from the fact that both Hungarian and Finnish are related languages and belong to the Finn-Ugric language family. When visiting Hungary we made an increasing use of our growing vocabulary and knowledge of the grammar. It was very nice to be able to converse with our family over there, although when they started to 'machine gunning' we had to ask them to slow down a bit.... Hungarians in general are shocked when a foreigner is able to speak their native tongue. We share that feeling, as Dutch is also not a very common and accessible language and hardly spoken by foreigners. My grandfather was quite an experience also. I met him for the first and last time in 1961. He had a house then near a small lake about halfway between Budapest and lake Balaton. We could not locate him although we clearly heard his voice somewhere nearby. As it turned out he was, at an age of about 76, hidden in the foliage of a very tall apple tree in front of the house. He came 'out of the green' and descended the long ladder to greet us. He was always proud that he never had drunk water, except as a child and 'maybe' he said. Water was something to wash your hands in. Candidly he would add to this statement that you usually did not eat your soap either....... When he was in the hospital once, his two sons would smuggle in bottles of wine and 'Palinka' (40 to 60% liquor homebrew from prunes or apricots) every day. When he was discharged he showed the empty bottles to the very angry doctor and claimed that the contents of the emptied bottles had probably cured and saved him and not so much the doctor's treatment. 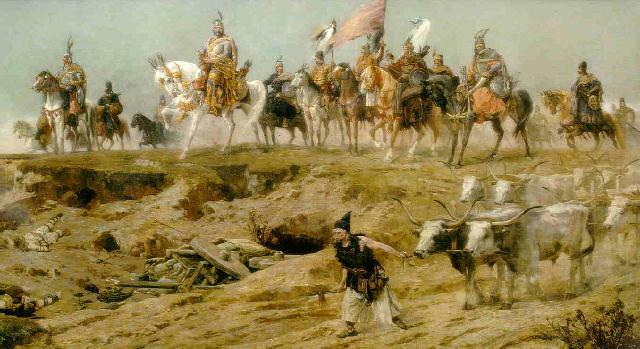 Hungarian artist Árpád Feszty's 1894 monumental panoramic painting depicts the settlement of Hungary by the Magyar chieftains in 896. Nearly twenty painters were involved in the work and in less than two years' time this monumental mural was completed. Many contemporary artists helped Árpád Feszty with the two year task that lasted from 1892 to 1894. Landscapes are by László Mednyánszky and the battle scenes by Pál Vágó. The painting, called a cyclorama, is housed in a special building in Opusztaszer, Hungary. The panorama is significant in artistic value and in size, as well. It is 120 meters long and 15 meters wide - forming a gigantic circle of 38 meters. This a detailed part of the painting which chronicles The Conquest - the most important event in Hungarian history - with more than 2000 people, including horseman, chieftains and peasants painted onto the canvas. The picture illustrates Chief Árpád on a White Horse. In the background, one can see the beautiful valley of Voloc [pronounced: "volots"] - the landscape around Munkacs, which was the scene of the Conquest, and is now part of the Ukraine. During World War II, the painting was damaged. Then, for years, it was stored in a basement room of the Museum of Fine Arts in Budapest. In 1970, the decision was made regarding the final home of the painting. The much-abused painting was to be placed in Ópusztaszer, the site of the first parliament held by the conquering Hungarians. It is quite astonishing that after more than thousand years quite a lot of similarities are still present. Apart from such common words also things like the missing verb 'to have', suffixes etc are proof of the connection to the Finn-Ugric language group. 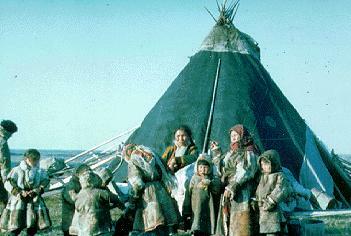 The Nenets, the indigenous reindeer herders are now under siege by oil industry. "If you take 100 pounds of my gold, then why can't you leave me just two", Yaloki Nimperov wrote in a letter to Senur Markianovich Khuseinov, Head of the Kamynskoye oil field which belongs to the Company Surgutneftegaz. Yaloki is angry. 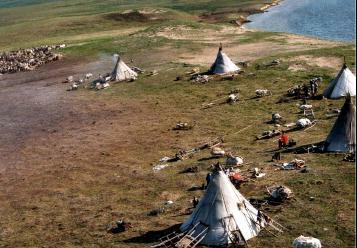 For many centuries his ancestors have been inhabiting this piece of land in the West Siberian Taiga, northern from the middle Ob on the river Pim. For centuries reindeer breeders and fishers knew how to sustain themselves within this barren land, how to withstand the chilling colds in the wintertime and the swarms of mosquitoes in the summer. Now their traditional way of life is in danger."